The legal cannabis industry has been called a Green Rush after the exponential growth of U.S. and Canadian companies in the sector, but what are the legal regulations governing advertising for this new industry? U.S. cannabis businesses and digital platforms alike are turning to their attorneys with questions about cannabis advertising. The framework lawyers must navigate to advise their clients about how, when, and where cannabis advertising can take place is complex and requires a multi-jurisdictional analysis. At the federal level, the Controlled Substances Act of 1970 creates a blanket restriction on cannabis advertising (and is the elephant in the room for many U.S. cannabis brands when it comes to taxes, and access to U.S. capital markets); state laws mostly concern preventing ads from targeting and reaching underage consumers, and truth in advertising (among many other regulations, depending on the jurisdiction). Surprisingly, the most challenging hurdles for cannabis advertisers are not statutes or regulations, but the company-made policies Facebook and Google employ to govern advertising on their respective platforms, which account for more than 59 percent of digital advertising market share in the U.S.
Any analysis of the U.S. cannabis industry begins with federal law and the conflict that exists between federal law, which prohibits cannabis sales and advertising, and the laws in the 30-plus U.S. states which allow licensed operators to do both. Many cannabis ads are banned by the CSA, but an ad that does not attempt to facilitate a transaction and merely advocates for the use of cannabis or another controlled substance is actually permitted under the act. Despite this nuance, and state legality in numerous U.S. jurisdictions, many digital marketing platforms hesitate when it comes to cannabis advertising, seeing the risks as outweighing the potential rewards (for now). In particular, the companies with a duopoly over digital advertising, Google and Facebook, both specifically prohibit cannabis advertising. Google Ads, which is the largest digital advertising platform by market share, is governed by policies that cover four categories: prohibited content, prohibited practices, restricted content, and editorial and technical quality standards. Cannabis is considered “prohibited content” and falls under the category (according to Google Ads) of dangerous products or services in the subcategory of recreational drugs, alongside crystal meth and heroin. The specific provision that should trouble legal cannabis businesses bars “ads for substances that alter mental state for the purpose of recreation, or otherwise induce ‘highs.’” The policy bans cannabis advertising despite the ability to geo-target ads to jurisdictions where cannabis is legal or target users who are aged 21 and over. Google has not made any indications that it is planning to change its cannabis advertising policies, though this may change if Facebook updates its policies or the U.S. legalizes cannabis at the national level. As reported earlier in March 2019, Facebook has formed a working group to examine its approach to cannabis, which indicates that it could be moving towards a more permissive stance. In the meantime, state legal cannabis businesses are allowed to create verified business pages on Facebook, and appear in search results (they were previously blocked from search). Allowing state-legal cannabis businesses to advertise is the next logical step and publishers and cannabis brands alike will be closely watching to see if Facebook revises its current policies. In U.S. states that have legalized cannabis, most of the regulations focus on preventing ads from reaching underage consumers and promoting truth in advertising. In California, for example, any cannabis advertising or marketing must collect data to show that at least 71.6 percent of its audience is reasonably expected to be over age 21 and include the state license number on the ad. Additionally, misleading claims are prohibited in advertising, and therapeutic claims should also be avoided. In addition to state law, some local jurisdictions also regulate cannabis signage, billboard placement and content. 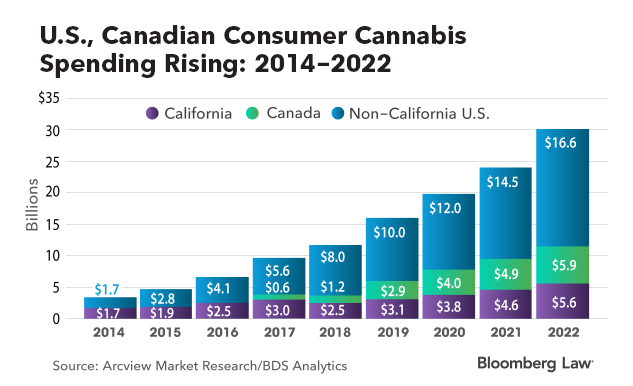 The adult-use cannabis industry has achieved significant milestones in recent years, despite digital advertising restrictions that have failed to evolve as quickly. A change in policy from Facebook, which appears to be in the works, could be a harbinger of more advertising (and revenue) opportunity for the emerging cannabis industry. Additionally, if U.S. federal legalization happens before that, it is likely that both Google and Facebook would follow suit and amend their policies, allowing the industry to realize its full potential. Lauren Estevez is an attorney and nationally recognized subject matter expert in cannabis and CBD business & law. She has completed over 100 legal matters in the cannabis space and advises cannabis industry brands, investors, and ancillary businesses on legal strategy, corporate transactions, and regulatory compliance.